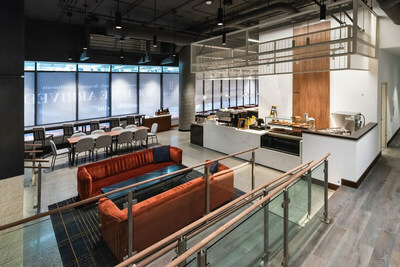 SEATTLE, Feb. 7, 2019 /PRNewswire/ -- A new landmark along Seattle's cityscape is the latest destination to live, lodge and dine in downtown Seattle. The 43-story Arrive' tower is the newest for-rent mixed-use property in the market and blends exceptional apartment living with 344 high-end luxury units, The Sound Hotel and Instagram-able food and drink options at Currant Bistro and Caffe Umbria. Located at 2116 4th Ave. adjacent to the epic Cinerama movie theater and close to many of Seattle's iconic destinations, Arrivé is currently leasing apartment units, and The Sound Hotel and Currant Bistro will soon open in mid-February. Caffe Umbria is a full-service grad & go coffee shop. The building will officially mark its grand opening in late February at a ribbon cutting with invited guests and dignitaries. "Every aspect of Arrivé is designed and constructed with intentionality and thoughtfulness toward our customers," says Mike Doran, project executive for The Molasky Group, the development partner with Binjiang Real Estate Group. "The construction team worked tirelessly to bring this asset online in 27 months, and the project partners worked in conjunction to bring an outstanding blend of apartment units, hotel rooms, and amenities to market. From its seven levels of subterranean parking to the breathtaking views at the penthouse units and roof-top amenity, Arrivé has a lot to offer people who want to live or lodge in downtown Seattle." Designed to be a vibrant property, The Sound Hotel Seattle Belltown a Tapestry Collection by Hilton, shares an active lobby with Arrivé and celebrates the sights, sounds, and tastes that are unique to Seattle. Its 142 exquisitely designed, well-appointed guest rooms occupy the first ten floors of the building, some offering expansive views. The hotel will feature the ground level restaurant Currant Bistro and a full-service, grab & go coffee bar. For meetings, the hotel's 7th Floor offers the Lupine Room: 770 square feet of divisible meeting space ideal for groups of up to 50, as well as Sound Bite Lounge, a relaxed, post-meeting gathering spot with seasonal outdoor seating and unobstructed views of the Space Needle. The Sound Hotel is the first Tapestry by Hilton in the state of Washington for Hilton Hotels and Resorts and will be managed by The Hotel Group, a leading national hotel management and investment company. "The hotel's design drew directly from the Belltown neighborhood's deep roots in the arts and local music scene, mixed in with the natural beauty of the Puget Sound region," says General Manager David Watkins of The Sound Hotel. "Warm, rich textures in our rooms offer visitors an authentic Northwest experience, while the artistic elements reflect Seattle as a bustling hive of creativity." 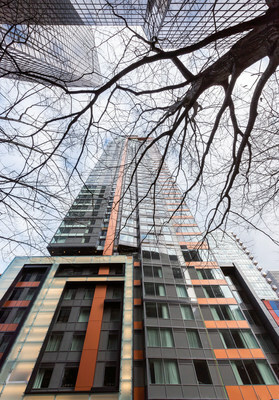 The top thirty-one floors of the building feature 344 apartments with a range of floor plans from studios to three bedroom/three bath units professionally managed and operated by Seattle-based Blanton Turner. All apartments have large windows showcasing Seattle's cityscape and natural beauty with many, especially the penthouses, offering spectacular views of Elliot Bay and Lake Union. Understated elegance defines Arrivé where residents can select from two designer-finish palettes to complement their personal style and décor. Each thoughtfully-designed residence includes air conditioning, quartz surfaces, modern kitchens with professional appliances and gas ranges. Select units include private terraces, walk-in closets, under-cabinet lighting and French-door refrigerators with PureAir filtration systems. Penthouse units have exclusive color palettes and include waterfall islands, Miele appliances, and cabinets by California Closets. Lighting, thermostats, and window treatments are controlled from a smartphone with instant connectivity to Z-Wave technology. All residents can take advantage of community spaces to host private gatherings or enjoy a glass of wine with friends on the spacious rooftop lounge with indoor/outdoor kitchen and bar. Energy efficient lighting is used throughout the building, which is targeting LEED Silver certification. Arrivé was developed by Hangzhou, China-based Binjiang Real Estate Group and Las Vegas, Nevada-based The Molasky Group of Companies. The general contractor is Denver, CO-based PCL, the sixth largest contractor in the United States. The architect is Weber Thompson, Seattle's most notable architectural firm. The Los Angeles office of Hirsch Bedner Associates (HBA), the world leader in interior design, created the signature décor at Arrivé.